Manchester United boss Sir Alex Ferguson says he was delighted by the warm reception fans gave Darren Fletcher on his return to action. 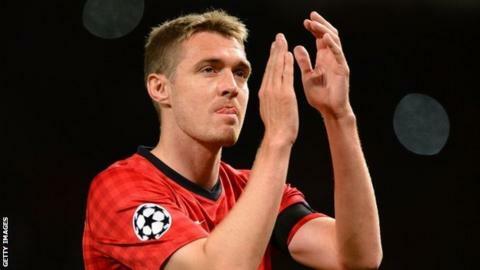 Fletcher, who has an inflammatory bowel condition, was given a standing ovation when he came off the bench in United's 1-0 Champions League win against Galatasaray after 11 months out. "The fans recognised what a tough time Darren has had," said Ferguson. "It was a mark of respect that they gave him a marvellous ovation." The 28-year-old Scotland midfielder, whose career has been in doubt because of his illness, replaced Paul Scholes with 11 minutes remaining. "Being out of the game for a year, it took him quite a few minutes to really get going," Ferguson added. "He did one or two good things but he can only get better after this." Fletcher's comeback was one of the few high-points of an unconvincing United display. Galatasaray had strong claims for a first-minute penalty turned down, and also hit the woodwork three times. United, who wore black armbands in honour of the two female police officers shot and killed in Greater Manchester on Tuesday, had to survive some nervous moments after wasting several chances to make the points safe, none better than Nani's weak second-half penalty that was saved by Fernando Muslera. It was United's third missed spot-kick of the season, following earlier failures by Javier Hernandez and Robin van Persie in Premier League games against Wigan and Southampton respectively. Ferguson admitted he did not know Nani was going to take it and said he should have decided the penalty-taker before the match began. "I had no idea, I think Nani just ran and grabbed the ball," he explained. "I think Robin should have taken it, to be honest with you. "In the future, we will have to decide on who will take penalties before the game. It is my fault because we should have done that on this occasion." Ferguson was frustrated by his side's failure to finish their Turkish opponents off but was also concerned by their poor passing at times. "In the first 15 minutes, we played very well, we got the goal and at that point thought it was going to be goodnight," he added. "But then we became really careless with the ball. Every time we lost the ball, they came forward and counter-attacked. They were a threat. "Fortunately, half-time came at a good time for us. In the second half, we were far more solid. The worrying part was that we missed so many chances. "Us missing the penalty kept them in the game because at 2-0 down it would have been very difficult for them to get back."